In the United States, popular devotion to Saint Jude is a twentieth century phenomenon. Many shrines, including The Rosary Shrine of Saint Jude, began in the dark days of the Great Depression. At that time, men and women needed someone to whom they could turn at moments of great and desperation. Today, located at Saint Dominic Church in Washington, DC, The Rosary Shrine of Saint Jude has become the center of devotion to Saint Jude in the nation’s capital. Regular daily devotions to Saint Jude, especially four Preached Novenas throughout the year, highlight the spiritual exercises carried out by the Dominican Friars at this shrine. In 1473 the Confraternity of the Most Holy Rosary was established at the Dominican Church in Cologne Germany. Before long the confraternity received Papal approval. 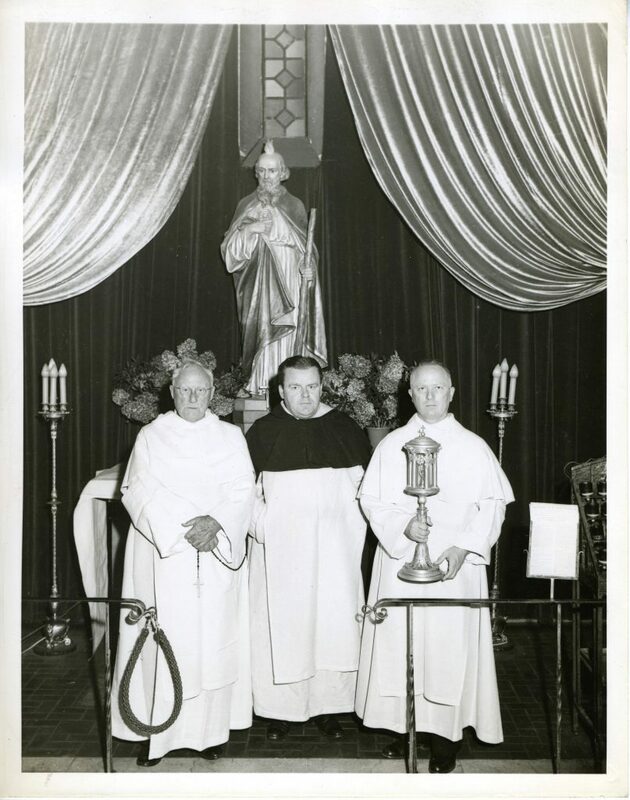 The Rosary Shrine of Saint Jude was founded in the late 1920’s in Detroit, Michigan (the altar near the Saint Jude shrine was set aside as the altar of the Rosary Confraternity, thus the significance of the name “Rosary Shrine of Saint Jude”). For more than 70 years, this shrine satisfied the needs of countless clients of the Blessed Mother and Saint Jude Thaddeus. Novenas of every kind were celebrated at Saint Dominic Church. Since the mid-1960’s, however, because of the deterioration of the neighborhood, attendance at the shrine steadily declined. In the 1990’s, few pilgrims came to the shrine. Still, many kept up correspondence with the shrine throughout the years. Meanwhile, the National Rosary Shrine of Saint Jude had been established in the early 1930’s in Washington, DC. For nearly 70 years, devotions at this shrine fulfilled the needs of countless clients of the Blessed Mother and Saint Jude Thaddeus. Preached Novenas were regularly celebrated at Saint Dominic Church with a steady stream of pilgrims and patrons in attendance. In the fall of 1998, the Dominican Fathers of the Province of Saint Joseph decided to combine the Rosary Shrine of Saint Jude (Detroit MI) with the National Rosary Shrine of Saint Jude (Washington DC). His Eminence James Cardinal Hickey approved the move of the Rosary Shrine of Saint Jude from Detroit to Washington DC. In early August of 1999, The Shrine Pipeline, the newsletter of the shrine, came into existence. Later that summer, the Rosary Shrine of Saint Jude moved from Detroit to Washington DC. In mid-July of 2000, the Pilgrim’s Guide, a small handbook for religious visitors to the shrine, was first published. In August of 2000, a new statue of Saint Jude Thaddeus was purchased. Early in 2001, the renovation of the Saint Jude shrine area was begun. Then on Sunday, October 28 2001, Bishop Leonard J. Olivier, S.V.D., D.D., Auxiliary Bishop of Washington DC, dedicated the restored and renovated Rosary Shrine of Saint Jude. The first issue of the shrine’s current newsletter, the Saint Jude Messenger, was published under Director Father Gabriel Gillen, O.P. Further renovations of the shrine were undertaken and completed by Pastor of St. Dominic’s Church, Father George Schommer, O.P.